So, she took a year sabbatical from her professional career and set out to make a difference in her community of 23 years, Independence. “Anyone who is really motivated and wants do something, especially in city there’s an openness for that,” she said. She met with Mayor Chris Reinersman, who’s also her brother, and discussed creating the Independence Volunteer Corps, a group of registered volunteers who the city can call on to work various events and start new events for the community. Davis agreed to organize the group, which has been a success with over 132 signed up. However, Davis wanted to take it a step further. “When I agreed to take this on, it was with the understanding that I’d take it a step further and drive not only community engagement but giving back. Thus, Independence Gives First was born. The program, supported by the Volunteer Corps, adopts an organization or charity to benefit each month. The donation drives culminate on the first Tuesday of the month. “The idea is that we think of giving before receiving and creating a community where the people look out for one another. The program started at last December and has already had significant impact. The Independence Gives First program has benefited Milestones Equestrian Achievement Program, a therapeutic horsemanship program that presents opportunities for individuals with challenges to enhance their quality of life. Independence Gives First collected donations and recruited new volunteers for Milestones’ lesson program. “As a small nonprofit organization this kind of community support is critical for us to carry our mission forward,” Milestones Executive Director Susan Kinsella said. Thanks to the help, Milestones will be able to provide more than 2,500 hours of therapeutic riding in 2019. “Those involved provided us with some much needed shelf-stable items that they collected and donated,” Stremmel said. “We will be giving the food to families in need which are nearly all Northern Kentucky residents. Independence Gives First volunteers will be a good partner in the future as we broaden our reach to more communities in the region. The pantry is open the third Saturday of each month and feeds about 100 families. Shopping is 9-11 am with a hot breakfast served the first hour. It is a “choice Pantry,” Stremmel said, meaning the shoppers can choose the food. They offer fresh produce, meat and canned foods which are donated from members of the community or the church purchases from the from Freestore Foodbank. 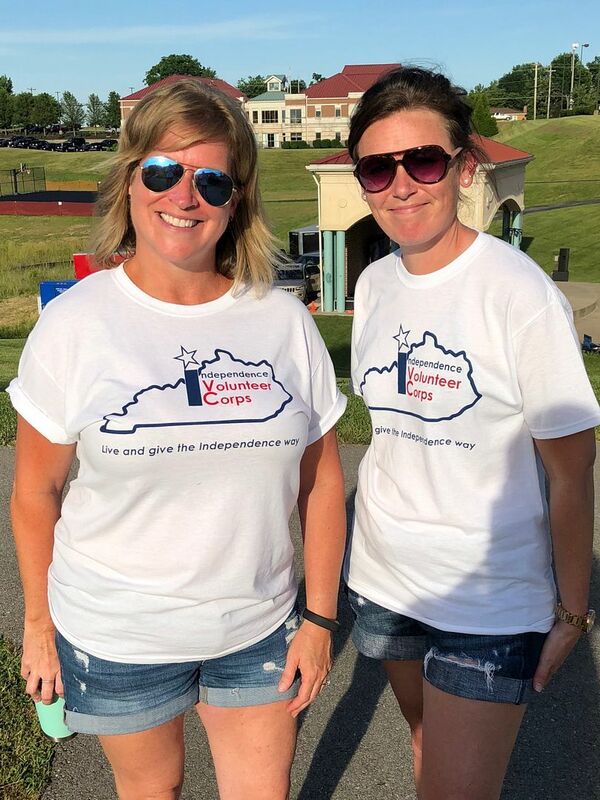 Independence Gives First is going to host a volunteer open house event 1-5 p.m. May 5 at the Independence Senior Center to further spread the word about the various volunteer and giving opportunities in the area. All local charities and organizations are invited to set up booths and distribute their information. According to Davis, this urge to help her neighbors, was instilled in her by her mother. Davis said that attitude creates community. You don’t have to be in Independence to join our program. Check out the website for information about all the opportunities to give: www.IndependenceVolunteerCorps.com. You can also follow the “City of Independence” Facebook Page to get updates on our Monthly Giving First events.